Sheffield’s inner-city music festival, Tramlines, will host its 10th anniversary at Hillsborough Park from Friday 20th – Sunday 22nd July 2018. The celebratory move will mark the first Tramlines to be held on just one site. With it comes a bigger capacity – licensed for up to 40,000 people - and the space to programme more festival-style entertainment than before. New additions include a comedy stage, pop-up cinema, kids and family area, a stage programmed by Sheffield institution, the Leadmill, and local legend, Jon McClure (Reverend and The Makers) and much more. Organisers are pulling out all the stops to not only make the 10th anniversary the most memorable yet, but a huge celebration of everything the Steel City has to offer. Tickets are now on sale from £35 plus booking fee and available from www.tramlines.org.uk. From its inception in 2009, Tramlines Festival has been on a continual journey of growth and progression. 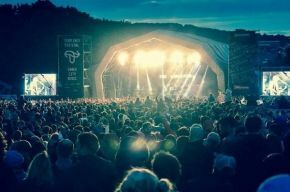 Its first major move came in 2015 when Tramlines doubled its main stage capacity with a move to Ponderosa Park, followed by a move out of the city centre venues in 2017 and into Sheffield’s parks, to become an exclusively outdoor festival. Over the years, The Libertines, Catfish and the Bottlemen, Sister Sledge, The Charlatans, Public Enemy, Basement Jaxx, Dizzee Rascal, The Coral, All Saints, Kano, Metronomy, The Cribs, Kelis, Primal Scream, and Toots and The Maytals are just a few of the big names to have graced the Tramlines stages. Whilst the lineup for the 10th year is yet to be announced, it is guaranteed to be its biggest yet, featuring the internationally acclaimed alongside the hottest emerging talent. The move to Hillsborough Park means Tramlines can stage a truly spectacular event with more space to roll out extra entertainment akin to a traditional greenfield festival. In total, four stages will make up Tramlines Festival 2018 including two stages of world-class music from the soon-to-be-announced, genre busting lineup. New for 2018 is a stage curated, on alternate days, by leading indie venue, the Leadmill and ‘The Reverend’ Jon McClure. The Leadmill will programme an alternative, heritage music offering on Saturday evening, whilst the Reverend’s Sunday Service, takes over the following evening. By day, this stage will induce belly laughs via the country’s leading comedy talent, programmed by Tramlines in conjunction with the Leadmill. Also brand new for the 10th year is the Library Stage. With an overarching leftfield vibe, it’s the place to check out contemporary live performances from a variety of emerging talent. The 10th Tramlines sees the return - and the expansion of - Into The Trees, a new area that was introduced in 2017. A ton of kids and family friendly entertainment has been programmed throughout the day, and post 7pm, an exciting bill of party DJs takeover for a night of dancing! Local breweries and food traders will line the music and entertainment offering giving festival goers a taste of Sheffield’s finest. Also featured for the first time is a pop-up cinema. As ever, Tramlines remains seriously good value for money. Weekend tickets start from £35 plus booking fee and can be purchased now from www.tramlines.org.uk. Tramlines also remains true to its roots as an inner-city festival. Hillsborough Park is situated just 13 minutes from Sheffield city centre via tram and is walking distance from many postcodes in the city. For up-to-the-minute information about Tramlines 2018, visit www.tramlines.org.uk or follow Tramlines on social ‘@tramlines’.